Initially both my boys were diagnosed as ‘non-verbal’ or having ‘significant speech delays’ dependent upon which expert we favoured. These days, they have lots of words and they choose to share them with us frequently. However, I think it would be fair to say that as often as not, this is not their preferred method of communication. When the pressure is on, they both revert to type and communicate by gesture, mimicry and a wide variety of noises, each of which have very specific meanings. ‘Noises’ are the most difficult things to describe, but I recognize each of them like speed dial tones as they are so familiar and ingrained into our family life. They convey an emotion more succinctly, accurate and immediately than words. I take him into the kitchen to show him. I tell him it is a surprise because this is one of the rare occasions when the ‘surprise’ will be met favourably. I warn him not to touch it, because it’s not dry yet, that it will take several days, until the weekend, to be dry enough to touch. I orient his body towards the counter and slip an arm around his shoulders to steady the pending explosion. With the other, I whip off the tea cloth to reveal his birthday cake decoration. 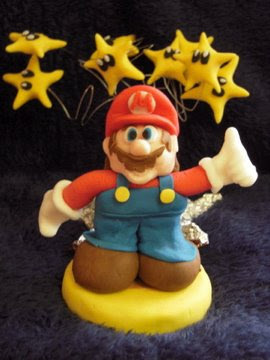 Although he is static with the soles of both his feet on the ground, he still manages to pogo two feet in the air with flailing arms, and the noise. The noise is a cross between a whipped zipper, the sign off salute of a radio host and a pitch to shatter glass. He lowers his chin to the counter for a closer look before clutching my forearm with both his hands for a quick squeeze of appreciation and the lick of an affectionate puppy. 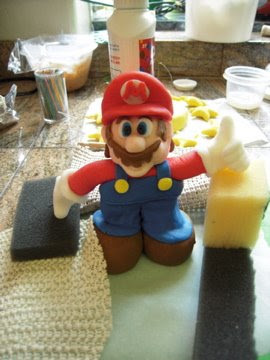 You can see lots more Mario Cakes over here. Posted on November 19th, 2008.